Thrip damage on azaleas comes from an insect that feeds in a particular method on different parts of the plant. Causing great damage to azalea plants, the insects are difficult to distinguish from other insects, so understanding symptoms is key to rejuvenating your azaleas. Keep your plant vigorous and consider chemical control measures appropriate to thrip attack. In order to understand the damage to your azalea plants, it is important to recognize the source. Thrips like chilli thrips cause extensive damage to the host plant. Thrips are tiny insects that display a pale body and dark-colored wings; thrips measure approximately 2 mm in length in their adult stage. Thrips begin as 60 to 200 eggs laid into plant tissue; within eight days, the eggs hatch into larvae that reach maturity within 13 days of egg hatch and die within a total of 22 days. When thrips enter the larval stage, they begin feeding on plant tissue for successful development into maturity. Depending upon the type of thrip, different plant parts are attacked with more voracity. Chilli thrips, for instance, focus on the buds and the leaves of the azalea as a food source. Other thrips, however, target other parts of the plant like pollen. While younger plants are more susceptible, more established azaleas are still vulnerable to attack, according to the Texas AgriLife Extension Service. Thrip damage on azaleas depends upon the particular variety of thrips; however, because they feed on the plant as their only food source, visible symptoms occur quickly and include diminished health, apparent damage to tissue where thrips have chewed through leaves and buds, curled leaves that take on an abnormal shape, stunted growth and leaf and bud drop. Due to the wide variety of thrips as well as the vast array of other insect infestations that may cause similar symptoms, for best results it is important to gather a sample of your azalea for study. 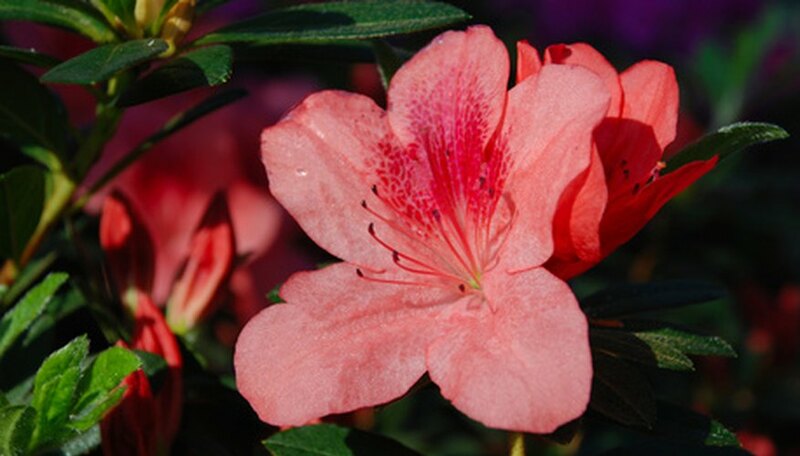 Quickly place an affected plant sample (include as much of an entire azalea with buds and leaves as possible) in a seal-tight plastic bag with a dry section of moisture-absorbent material such as a paper towel to create a dry environment. Bring your sample to a laboratory or acquire a laboratory address from your county extension agent where the sample may be delivered, advises the Texas AgriLife Extension Service. To remove thrips from your azaleas for prevention of further damage, consider chemical control through application of appropriate insecticides. Make sure the insecticide you choose is formulated to remove thrips from azalea plants. For example, treat chilli thrips with an application of insecticides with the following active ingredients: spinosad or acephate. Also, realize that use of chemical controls may cause damage to neighboring plants or other non-pest insects. When in doubt, contact a professional. What is the Scientific Name of Azaleas? Can Azaleas Take Full Sun?